During one of the longest State of the Union addresses on record, there were some fleeting moments of comity. But an address laden with historical references and ornate language did not appear to convince many of his opponents, and afterward there were few signs Washington was changing its tenor. His calls for conciliation — which did not address his role in inflaming partisan divisions — were met with mostly stone-faced silence from Democrats, who bitterly oppose most of his agenda and whose memories are still fresh with the 35-day government shutdown. It was his first time addressing the Democratic-majority House, and his political nemesis, House Speaker Nancy Pelosi, sat behind his shoulder, offering only sparing applause. “An economic miracle is taking place in the United States — and the only thing that can stop it are foolish wars, politics or ridiculous partisan investigations,” Trump said, as Pelosi visibly scoffed behind him. Democrats have promised they will use new investigative powers to probe everything from Trump’s tax returns to his policy decisions to members of his Cabinet. Special counsel Robert Mueller is also still pursuing his investigation stemming from Russian interference in the 2016 election. Even as he declared that the “state of our union is strong,” the President once again sought to portray the situation on the southern border as an “urgent national crisis” that he said threatened the security of “all of America.” He renewed his demand for a border wall in a lengthy and severe section of his speech devoted to immigration. But President’s track record indicates the luster of unity is unlikely to last: Many of his past attempts at bipartisanship have quickly evaporated amid tweeted barbs. Trump made clear he is not wavering on his demand for a $5 billion border wall — which Democrats have declared a nonstarter — even as he pulled out rhetorical flourishes envisioning a post-partisan Washington. Trump appeared to be referring to controversial comments Northam offered on a radio show in which he described the birth of a “nonviable” fetus or infant with “severe deformities.” Northam was referring to the decision between a physician and parents about whether to resuscitate an infant in that condition. “The infant would be delivered. The infant would be kept comfortable. The infant would be resuscitated if that’s what the mother and the family desired. And then a discussion would ensue between the physicians and the mother,” Northam said. The President was confronted by a Democratic Party invigorated by its own base, as dozens of female Democratic lawmakers donned white in honor of the women’s suffrage movement. 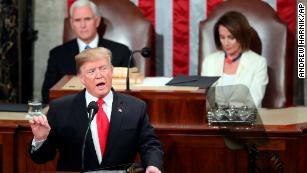 Those lawmakers stood stone-faced during the overwhelming majority of Trump’s speech and quickly shuffled out of the chamber as Republican lawmakers cheered his remarks. But when Trump touted gains by women in the workforce and in Congress, those women lawmakers in white began to whoop and cheer — though they appeared to be congratulating each other, not applauding the President. And he touted the peace talks in Afghanistan to end the US’ longest-running war, saying he has “accelerated” negotiations to reach a political settlement. “Our troops have fought with unmatched valor — and thanks to their bravery, we are now able to pursue a political solution to this long and bloody conflict,” Trump said. The annual address from the US Capitol is one of the most familiar set pieces of the presidency, and one of the most watched. Prior to the speech, Trump believed it would lend his arguments credibility at a vulnerable moment, as his poll numbers trend lower and Democratic challengers — many of whom were in his audience — begin to announce their intentions. Polls show Trump is unpopular among most Americans and a monthlong partial government shutdown over securing funds for the wall only damaged him further. But there were no signs he is backing off his demands during Tuesday’s speech. They have until February 15 to reach an agreement. It now appears more likely he will declare a national emergency on the southern border as a way to secure the wall money without congressional approval. Aides debated whether to announce the move during the State of the Union but ultimately decided against it. Last week Senate Majority Leader Mitch McConnell warned Trump during a private meeting that such a move would be unwise. Ahead of the address, Trump was sniping at Democrats who dismissed his calls for unity. Senate Democratic leader Chuck Schumer accused the President of “blatant hypocrisy” in remarks on the Senate floor Tuesday.